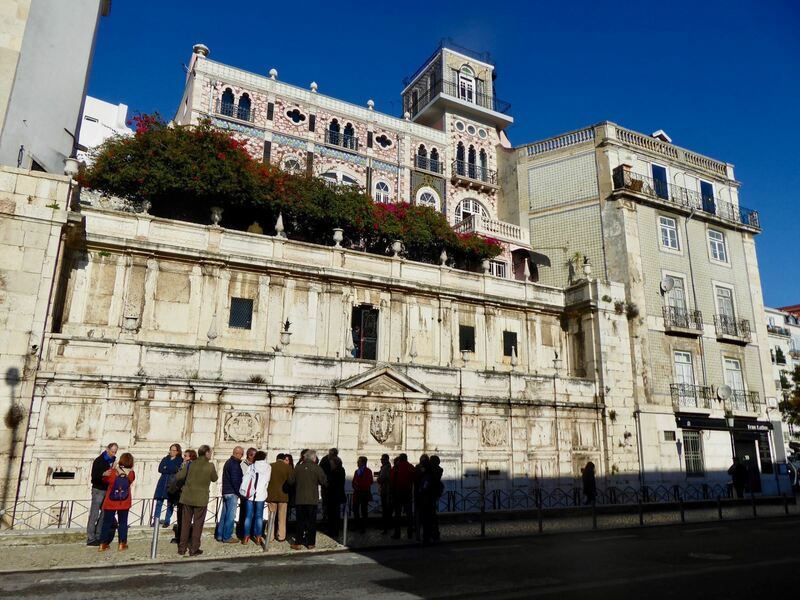 On a recent sunny November morning two members of the Society enjoyed a walk through the Alfama and down town Lisbon with the theme “Lisboa Hebraica”. The walk was organized by the Cultural Department of the Câmara Municipal de Lisboa and led by best-selling author Richard Zimler whose book “The Last Kabbalist of Lisbon” will be familiar to many of our members. We met at the Chafariz d’el Rei a few minutes walk further east from the Casa dos Bicos and at the foot of the Alfama district. This fountain (non-active), formerly fed by springs from the Alfama, is one of the oldest in Lisbon. It had nine spouts, each spout being used by designated social groups such as the water sellers, inhabitants and sailors from nearby ships. The present structure, of classical style and dating from 1864, is badly in need of restoration, but is still nevertheless impressive. 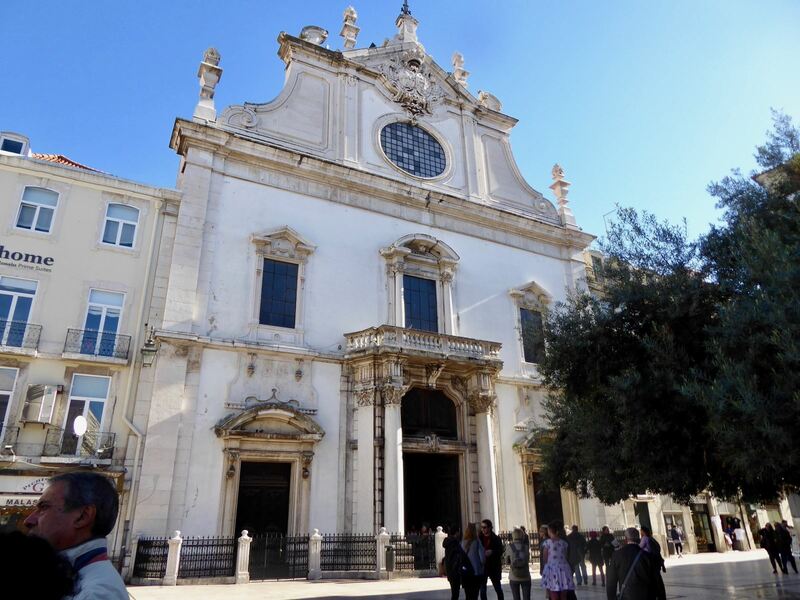 Our walk took us up through the Alfama, past the Sé, and then downhill and along Rua Augusta to the corner of Praça da Figueira by the church of São Domingos. 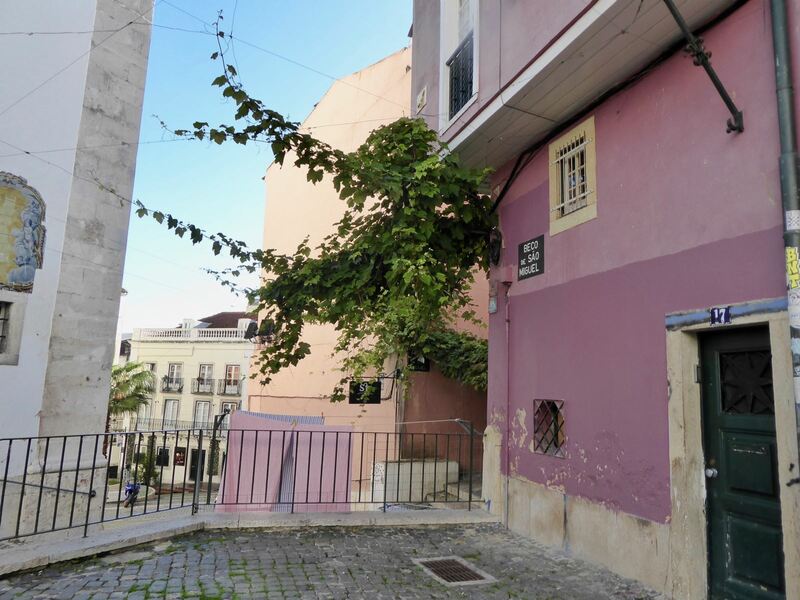 The Alfama and the eastern part of down town Lisbon formed one of the principal Jewish quarters but today only mere traces remain to be seen. Richard told us of the history of the Jews in Portugal. It is believed that some Jews may have accompanied the Phoenicians to Portugal in about 200 AD and they certainly accompanied the Romans. In medieval Portugal the Jews were well respected citizens who were important to the nation’s economy as merchants, tradesmen and shopkeepers. Matters began to change after the establishment of the Inquisition to repress heresy in Spain in 1478 and Jews began to flee from Spain to Portugal. In 1492 Spain, under the Catholic monarchs Ferdinand and Isabella, expelled all its Jewish population, tens of thousands fleeing to Portugal. Portugal was not able to absorb such a number and King John II granted them temporary asylum, encouraging them to settle in other countries. In 1497 King Manuel I, who had married Princess Isabella of the Asturias, came under pressure from Spain and decreed that all Jews had to convert to Christianity or leave the country without their children. In 1506 there occurred the Lisbon massacre of about two thousand New Christians which began at São Domingos Convent on Sunday, 19 April 1506. During mass the faithful were praying for the end of the drought and plague that were sweeping the country when someone swore they had seen the illuminated face of Christ on the altar — a phenomenon that could only be explained by the Catholics present as a message from the Messiah, a miracle. One of the New Christians, a converted Jew, thought otherwise, and voiced his opinion that it had been only the reflection of a candle on the crucifix. The men in the congregation, on hearing this, grabbed the man by his hair and brought him outside the church where he was beaten to death by the crowd and his body burnt in Rossio Square. Subsequently the mob went on the rampage and killed all the New Christians they could find on the streets, or in their houses, and burning their bodies by the Tagus or in Rossio. Following the massacre, a climate of suspicion against the New Christians pervaded Portugal. The Portuguese Inquisition was established in 1536; many families of Jewish ancestry either escaped or were banished from the country. They settled in places such as Amsterdam, Thessaloniki, Constantinople, France, Morocco and Brazil. So it was appropriate that our walk should finish by the Church of São Domingos, the scene of the massacre of 1506, where there is a monument commemorating the massacre. 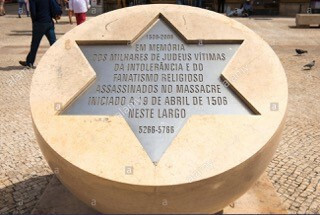 Its inscription within a Star of David translated from Portuguese reads: "In memory of the thousands of Jews who were victims of intolerance and religious fanaticism, killed in the massacre that started on 19 April 1506, in this square". The base has a verse from the Book of Job etched onto it: "O earth, cover not thou my blood, and let my cry have no place." Your fellow members were so impressed by Richard’s knowledge and enthusiasm that we invited him to speak to the Society on the theme of the Jewish presence in Lisbon. More information about Richard's lectures will be posted presently.